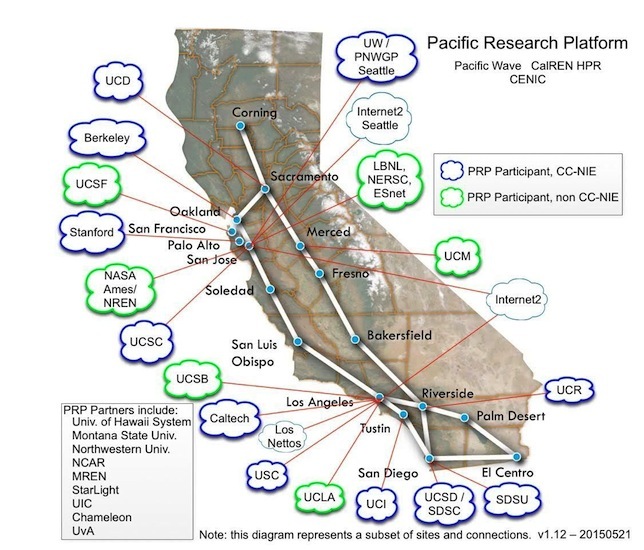 Researchers in Pacific coast states are gaining access to a networking infrastructure that connects the science "DMZs" of multiple research institutions. A DMZ is a secure network "enclave" for high-speed data transfer frequently needed in data-intensive research projects. The Pacific Research Platform (PRP), as it's named, will eventually allow participating universities and other research organizations to move data a thousand times faster than the Internet that currently links campuses. The new high-capacity, regional "freeway system" is being built with a $5 million grant given by the National Science Foundation to the Universities of California in San Diego and Berkeley. Participants of the PRP include most of the research universities on the West Coast: the 10 University of California campuses, San Diego State University, the California Institute of Technology, the University of Southern California, Stanford and the University of Washington. These institutions are already connected via the 100-gigabit CENIC. The new initiative also extends to include several other campuses outside of California, the Lawrence Berkeley National Laboratory and four national supercomputer centers, among other participants. The PRP builds on prior NSF and U.S. Department of Energy investments. In the last three years, NSF has funded more than 100 American campuses to upgrade their network capacity for greatly enhanced science data access, creating science DMZs within each. The PRP partnership extends that to a regional model. The drivers of the PRP are 15 multi-campus data-intensive application teams, providing feedback to technical design staff that includes a large group of network engineers, network providers and measurement programmers at the PRP institutions. The application areas include particle physics, astronomy/astrophysics, earth sciences, biomedicine and scalable multimedia, which in turn will provide models for other applications. "PRP will enable researchers to use standard tools to move data to and from their labs and their collaborators' sites, supercomputer centers and data repositories distant from their campus IT infrastructure, at speeds comparable to accessing local disks," explained PRP co-principal investigator Thomas DeFanti, a research scientist at UC San Diego. The project came out of a retreat of researchers and a subsequent 2014 workshop that led to a decision to explore the feasibility of the PRP. Network engineers from a number of PRP member campuses worked for 10 weeks during the early part of 2015 on a proof-of-concept demonstration that used elements of the proposed infrastructure that already existed. The test involved disk-to-disk data transfers from within one campus science DMZ to another. After tuning and optimization tests demonstrated data transfer speeds of 9.6Gb/per second out of 10 from four UC sites to San Diego's campus; two transfers reached 36Gb/s out of 40 from UCLA and Caltech to UCSD. One PRP-optimized test moved 1.6 terabytes of data in four minutes; the default campus Internet required three hours to transfer just 0.1 terabytes. "Research in data-intensive fields is increasingly multi-investigator and multi-institutional, depending on ever more rapid access to ultra-large heterogeneous and widely distributed datasets," said UC San Diego Chancellor Pradeep Khosla in a prepared statement. "The Pacific Research Platform will make it possible for PRP researchers to transfer large datasets to where they work from their collaborators' labs or from remote data centers." The PRP will be rolled out in two phases. In the first phase, the work will focus on getting all member campuses running on its data-sharing architecture, PRPv1. Once that's done, the consortium will develop and offer PRPv2, an IPv6-based application with enhanced security and software-defined networking features. NSF has awarded funding to hold a PRP design workshop at UC San Diego in October. This event will bring together application driver researchers, distributed computer architects, network engineers and multi-institutional IT/telecom administrators to refine the PRP implementation.